A disturbance in any medium except vacuum causes vibrations whose energy is transmitted from atom to atom in all directions from the epicenter. These waves encode the amplitude (intensity) and frequency (pitch)(see Figure 1) of the disturbance thus broadcasting information to anyone who can decode the vibrations. Animals, whose very existence depends on whether they can effectively catch food as a predator or evade being food as prey, sense these waves using pressure sensors which convert vibrations to nerve impulses that are perceived as touch or sound, depending on the sophistication of the sensors and the decoding capacity of the owner’s brain. 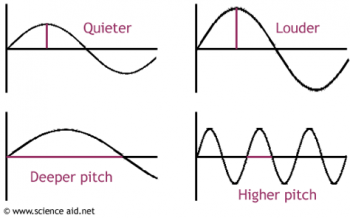 Humans can detect vibrations whose frequency ranges between 20 – 20,000 Hertz as sound. [A fun tone generator is at http://www.szynalski.com/tone-generator/ and you can check your hearing acuity. ] In this article, I will review the general mechanism of sound perception in vertebrate and invertebrate animals. We are familiar with the flap-type pinna of the outer ear which perches on either side of the head. Although it is popularly used to hang baubles on, the convolutions of this cartilaginous flap make it a sophisticated orienteering tool to help determine the direction that a soundwave comes from. The other two parts of the ear, which are not visible from the outside, are the middle and inner ear (Figure 2). The pinna of the outer ear gathers sound vibrations and channels it through a tube to the middle ear. 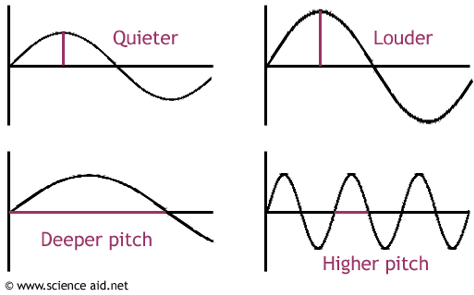 The direction of the origin of the sound is perceived by the slight difference in time of detection by the two ears. The middle ear contains a cone-shaped membrane, the eardrum or tympanum, which vibrates in response to the waves channeled there by the pinna. The eardrum does not vibrate in synchrony throughout. The convolutions of the pinna receive and reflect the vibrations differentially, depending on where the sound originates with reference to the pinna itself. Vibrations of the eardrum’s membrane are conducted deeper by a series of three bones resembling, in order, a hammer, anvil and stirrup – the Latin names are malleus, incus and stapes, respectively. [For trivia fans, located here is the smallest skeletal muscle of the human body, the 1 mm long stapedius, whose job is to stabilize the fragile stapes bone.] 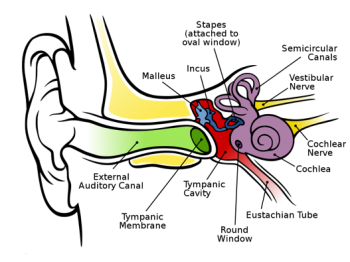 The malleus is proximal to the eardrum and the stapes connects to the inner ear. If you were reading attentively, you will have noted one unexpected link between vibrations and perception – hair-like projections on cells. However, the hair involved in hearing is not at all like that on our head. The hearing-related projections, called stereocilia, are more akin to the villi of the small intestine in that they are actually extensions of the cell itself. They are typically stationary and only move when triggered by vibrations of the fluid around them. When they bend, they open up small channels through which ions (charged atoms) move. This movement of ions sets up an electrical gradient that is transmitted to the brain as a nerve impulse. A vexing question is how invertebrate animals, who don’t even have ears, hear. Invertebrates include worms, clams and bees, and an examination of their perception of sound has to redefine the word “hear”. We know they can perceive vibrations in the medium, but is this a sound or a touch sensation? Acoustic detection by mechanosensors, perhaps? Ah, the petty tyranny of terminology. All we can be confident about is that this ability to convert vibrations in the medium to nerve impulses allows invertebrate animals to locate a source that is not directly in contact with their bodies – this is technically hearing rather than touch, which requires physical contact with the sensor. Mechanosensors are hugely varied in type and location, from hair-like projections on ciliated cells like those in the vertebarate Organ of Corti to vibrating tympanum membranes; in short, any structure that can move in response to external pressure potentially provides some information. Additionally, there are sensors for movement – sac-like hollow cavities called statocysts lined with hair cells that can sense the movement of rocky structures called otoliths (analogous to statoliths in vertebrates) and that provide both acceleration and orientation information . It would be remiss of me not to mention here that one of the loudest sounds in the animal world is made by the pistol shrimp snapping its claws . The force generated causes a cavitation bubble which collapses with a cracking sound measured at 200 decibels and temperatures comparable to those on the surface of the sun. The shockwave it produces can stun the shrimp’s prey. By comparison, a jet liner at takeoff produces 150 decibels. There are other complications to a straightforward analysis of sound perception in invertebrates: non-conducting armor-like or rocky shells that enclose the animal, sizes of animals so small that they are in the same size range as soundwaves themselves and, not least, identifying the sound made by a potential mate among the veritable cacophony of sounds that exist on a mid-summer evening. I will discuss how animals navigate these complications in a future article. For now let’s just look at insects in terms of vibration-making and vibration-receiving. Two major mechanisms are in operation in insects for vibration production: stridulation and resonance. Stridulation is a thrumming sound produced by rubbing a scraper with larger ridges against a file with small ridges. The organs that function as file and scraper vary, from wings to legs to abdomen to mouthparts in many insects such as grasshoppers and crickets. Resonance sounds are produced by Hymenoptera (bees, ants, wasps) and Odonata (dragonflies) which do not have stridulation apparatus. Receptors for vibration perception are tympanums, membranes that vibrate in a manner similar to the eardrum of vertebrates. The vibrations are transmitted to mechanosensory organs that transforms them to nerve impulses. The tympanum of arthropods has a bewildering variety of shapes and locations and apparently evolved independently many times; some insects even use their whole wings like “ears” for enhanced audition. Bees are famous for their “waggle dance” where bees communicate the location of food sources in relation to the position of the sun. The waggle dance causes the comb’s wax substrate to vibrate and these vibrations are picked up by mechanosensory chordotonal organs in the tibia of legs of the other bees that stand on the same comb surface. However, bees also disturb the air around them by compressing thoracic segments to make piping sounds, and oscillating their wings to produce buzzing sounds. These vibrations are picked up by the Johnston’s organ, a structure in bees’ antennae that detects air movement and links it to nerve impulses. It also helps bees monitor their flight speed, so it is difficult to classify them uniquely as hearing organs. They are more like whiskers. Humans are notoriously self-centered, and we tend to impose our own perceptions on the larger world. Learning about the variety of processes that operate in non-humans is a good way to broaden the mind and open the eyes. One way is to engage with organisms on their own plane of existence and their existential issues. To wit, take the philosophical question: “If a tree falls in the forest and no one is around to hear it, does it make a sound?” Should it be rephrased to: “If a tree falls in the forest, will it produce vibrations that will be perceived”? Budelmann, B.U., Hearing in nonarthropod invertebrates, in The evolutionary biology of hearing. 1992, Springer. p. 141-155. Koukouvinis, P., C. Bruecker, and M. Gavaises, Unveiling the physical mechanism behind pistol shrimp cavitation. Scientific Reports, 2017. 7(1): p. 13994.